Traveler's Tales: Lego: Lord of the Rings "Would Work"
Traveler's Tales, the makers of all of the LEGO games said that a Lego: Lord of the Rings "would definitely work." When Lego Star Wars came out back in 2005, nobody thought it'd be a success. But something about the quirky, speechless comedy and the myriad of familiar Star Wars characters connected with kids and adults alike. Lego Indiana Jones and Lego Batman have continued the legacy and now that we have Lego Harry Potter coming out in May and even a Lego Clone Wars game due sometime this fall, its easy to point to other intellectual properties that might easily be adaptable to Traveller's Tales winning formula. With all of the characters and heroic storylines of the movies, a Lego Lord of the Rings seems like it would be at the top of that list. 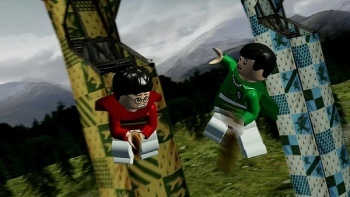 The producer of Lego Harry Potter: Years 1-4, Loz Doyle wouldn't confirm or deny that such a game was in discussion, but he said it is definitely possible. "It's [Lord of the Rings] got three films - well, plus one if you add The Hobbit. It's got a lot of cool characters. It could definitely work," he said. He went on to admit that most big-budget franchises would fit the formula. "There are very few things that wouldn't work, don't you think? There is an age limit, and Lord of the Rings is aimed younger in terms of appropriateness. So in that respect they work. Yeah, it would definitely work." With Warner Bros. re-acquiring the rights to the films from EA at the end of 2008 and the fact that WB owns Traveller's Tales, a Lego: Lord of the Rings seems like an inevitability at this point.